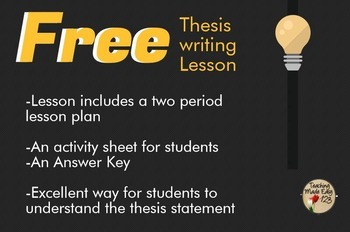 Thesis writing is often an abstract concept for students and it is one of the most important things to know when writing an essay. This FREE activity will help students to correct problematic thesis statements, while learning how to compose their own. 1) Attempting to write a thesis statement based on the following topic: Do we have the right to play God when it comes to human life? 2) Group activity where students must identify the weaknesses in 5 thesis statements and rewrite them to make them better.